I got this as a Christmas gift. Read to find out what I thought of this product. 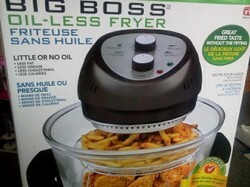 Product Description: Oil-less deep fryer from the Big Boss brand. The cooker fries items using hot air and either no oil or very little oil. My wife purchased this for me as a Christmas present last December and I finally had a chance to use it last night when making frozen fish and homemade French fries for dinner. I first learned about the Big Boss Oil-less Fryer when I was shopping at a kitchen store a few months ago an noticed it on the shelf. It looked interesting but, since I'm usually pretty hesitant to buy myself anything (especially when it is somewhat expensive), I didn't purchase it. My interest did not go unnoticed by my wife, however, and she surprised me by buying this product for me as a Christmas gift. Unfortunately, I didn't get an opportunity to use the fryer right away and finally was able to take it out of the box last night. As it turns out, waiting was a mistake. This product is as good as advertised. I ended up using this product last night because my oldest daughter really wanted homemade French fries and I figured that was a good opportunity to try it out. And, since I was going to be using it anyway, I decided to pick up some frozen fish and shrimp to cook in it as well. When I first took this out of the box, I was a little intimidated because there were several pieces and it looked complicated. However, it turned out to be relatively easy to set up and, after washing everything, I was ready to go in a matter of a couple minutes. I followed the cooking instructions that came with the fryer, opting to spray a small amount of olive oil on the items before frying them. I started with the fries and they came out as well as I would expect them to come out of a regular deep fryer. They were crisp, flavorful and weren't full of oil. When I cooked the fish, I had the same results. The fish and shrimp ended up a golden-brown color and the breading got crispy. This was also the same with the onion rings I elected to cook at the last second (mostly just to see if they would turn out too). Since I used almost no oil (just what I sprayed lightly on the food), clean up was easy. It was pretty much just washing out the glass bowl and cleaning the rack/basket I used while making everything. This, in itself, was a major improvement over our regular deep fryer, mostly because I didn't need to figure out what to do with the oil afterwards. After using this product, I did find there were a couple minor things I would change about it. The first is I'm not a huge fan of the glass bowl. I do like being able to see my food when it is cooking. But, that bowl is large and heavy, making it a little difficult to handle, especially since it is breakable. Also, I think the product would be slightly better if it had a basket that could be flipped over since the cooking instructions do call for flipping the food halfway through. In its current form, you do have to stop the cooking process long enough to manually flip everything over. These, however, are minor things and, overall, I did find I enjoyed using this product. After seeing how easy it is to use and reading about all the other things I could make in it (including pizza and popcorn), I am certain it will be getting much more use in the future. This is a product that is easy to use and works as well as advertised. 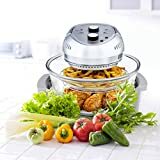 It's a bit pricey (typically around the $100 mark) but well worth the money if you like fried food but want something that uses a healthier/less messy way of cooking it. This sounds fantastic! Looks like I may have to start saving up some money....thanks for the review! A review of the frozen pasta product we purchased through Schwan's Home Delivery. A review of the frozen one-serving lasagna dinner available at Aldi for 99 cents.